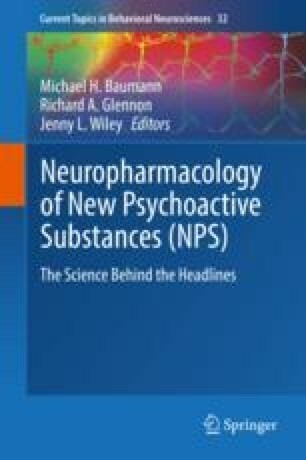 The present review briefly explores the neurotoxic properties of methcathinone, mephedrone, methylone, and methylenedioxypyrovalerone (MDPV), four synthetic cathinones most commonly found in “bath salts.” Cathinones are β-keto analogs of the commonly abused amphetamines and display pharmacological effects resembling cocaine and amphetamines, but despite their commonalities in chemical structures, synthetic cathinones possess distinct neuropharmacological profiles and produce unique effects. Among the similarities of synthetic cathinones with their non-keto analogs are their targeting of monoamine systems, the release of neurotransmitters, and their stimulant properties. Most of the literature on synthetic cathinones has focused on describing their properties as psychostimulants, their behavioral effects on locomotion, memory, and potential for abuse, whereas descriptions of their neurotoxic properties are not abundant. The biochemical gauges of neurotoxicity induced by non-keto analogs are well studied in humans and experimental animals and include their ability to induce neuroinflammation, oxidative stress, excitotoxicity, temperature alterations as well as dysregulation of neurotransmitter systems and induce changes in monoamine transporters and receptors. These neurotoxicity gauges will serve as parameters to discuss the effects of the four previously mentioned synthetic cathinones alone or in combination with either another cathinone or with some of their non-keto analogs. Bath salts are not a defined combination of drugs and may consist of one synthetic cathinone compound or combinations of more cathinones. Furthermore, this review also presents some of the mechanisms that are thought to underlie this toxicity. A better understanding of the cellular and molecular mechanisms involved in the synthetic cathinones-induced neurotoxicity should contribute to generate modern therapeutic approaches to prevent or attenuate the adverse consequences of use of these drugs in humans.